Think about it, did you consciously make a decision to brush your teeth this morning? Probably not. At some point in time you did make a conscious decision to brush your teeth and you would have done it several times. After doing it consciously several times, it became sub-conscious and it was put on autopilot. How did that happen? This happens based on the relationship between the conscious mind and the sub-conscious mind. A thought that has a strong emotion attached to it. For example in a traumatic situation, there is usually a strong emotion attached to the situation that causes the thought to linger in the mind for a long, long time. A thought that has a strong emotion attached to it – If an event occurs in our lives and there is a deep emotion attached to it, it creates a strong impression in the sub-conscious, programming of the sub-conscious mind. The sub-conscious mind that then starts to play the thought on auto-pilot in a continuous loop unless it is replaced by an opposing thought. It is like the conscious mind creates a recording in the sub-conscious mind and then the sub-conscious mind plays the recording in a loop. While this works for both positive and negative emotions, it is the negative emotions that really create deep fears in our lives. Most of the clients I work with have a similar story. They are often very motivated and have done all the things they know they should do but are not where they want to be in life. Are you in a similar situation? In a recent case I had an intelligent, self motivated, ambitious professional who just have not been able to achieve what she wanted to achieve. Through the Scientific Happiness coaching system we were able to identify the precise event in her life that created the deep imprint in her sun-conscious mind life that kept her back from her highest potential. We discovered that when she was 7 years old, she was having a challenge with a question in her homework from school and she went to her dad for assistance. He thought that the question was simple enough and felt that she should have been able too solve it and shouted ‘Are you dumb, this is so simple, even your younger sister can figure this out!!!’. My client cried and felt very hurt and shocked at the reaction of her father. This situation created a mark in her sub-conscious mind that played over and over and impacted the results that she got in her life. That is, until we were able to identify it and remove it. So everything that my client attempted to do would be damped by the sub-conscious thought (completely unknown to her) that she was dumb and not good enough. She did not feel that way about herself consciously but this is what was playing in her sub-conscious mind, keeping her back from really having the most successful life that she was capable of. Unfortunately, this is the situation with most people on the planet, not just my clients. We have many negative sub-conscious thoughts that are keeping us back from achieving all that we can achieve. These are commonly referred to as self-saboteurs. Repeated Thoughts – when you think a thought regularly, it gets lodged in the sub-conscious mind. The sub-conscious mind sees that you are constantly thinking this thought so it puts it on autopilot. What do you think about? You think about what you see, what you hear, what you feel, what you taste etc. But because the brain thinks in pictures, what you think about most is what you look at and secondly what you hear. This is why it said that where you will be in the next five years will be a function of what you read, what you look at, what you listen you and the people you associate with. Additionally, the more specific the thought, the more solidly the thought gets lodged in the sub-conscious mind. So the aim should be to have the sub-conscious mind playing only the positive thoughts that would lead you to the achievement of your best life, be it money, relationships, business, health, career or spirituality. It is therefore critically important to set proper goals and look at them everyday. See the 10 critical elements of a properly set goal. Please note that staring at your goals will not make them come through, you have to take action! But programming the sub-conscious with the positive beliefs and thoughts will begin to focus the mind on the thoughts, people, resources, ideas which you need to achieve your goal. The problem is that most people do not know what they really want and have trouble putting it into properly set goals. 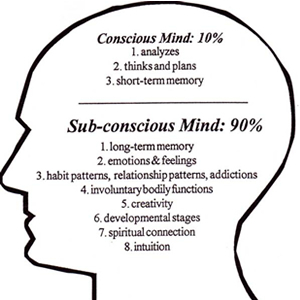 This relationship between the conscious mind and the sub-conscious mind played a major role in the relationship challenges in had for most of my life. My parents would argue frequently when I was a kid and seeing this all the time formed a sub-conscious belief that frequent arguments are a part of relationships. I hated it and used to run as way as from it as I can. Disliking it however did not prevent a thought being lodged into my sub-conscious mind that frequent arguments are a usual part of relationships and the disliking may have in fact further solidified the thought/belief. So this manifested in me having relationships that were fraught with unnecessary arguments which eventually caused the demise of these relationships. I had to go back and find the sub-conscious beliefs that were driving my un-explicable behaviours. I worked very hard at changing my sub-conscious beliefs and while I am not out of the woods, my relationships have improved drastically. Understanding that over 90% of the decisions we make and the actions we take are completely unconscious can hopefully make us more aware of our selves. 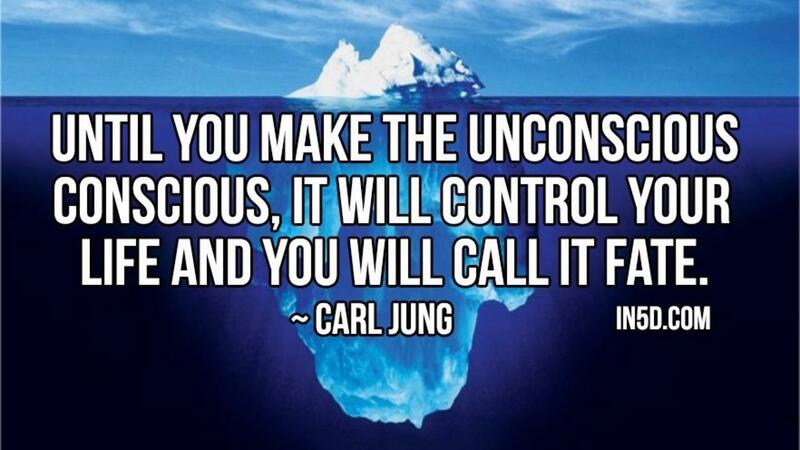 The sub-conscious mind never goes to sleep, it is always on. When you fall asleep, your conscious mind also goes to sleep but it is your subconscious mind is really what keeps you alive, it keeps all the bodily functions running while you are asleep. It obviously keeps most things running while you are awake including most of your actions and decisions. The conscious mind can either accept or reject information given to it but the sub-conscious mind accepts everything that it is put into it. Therefore your repetitious thoughts impacts the results that you get in your life. How do you use this information to make you more successful? Intentionally program the right beliefs into your sub-conscious mind to help you achieve the life you want. The amount of money you earn. Your ability to lose weight. In the Hawaiian system of Hoponopono, the relationship between the conscious and sub-conscious mind is referred to as the relationship between the mother and the child, the conscious mind being the mother and sub-conscious mind being the child and it is consider the most important relationship in life. Joe Vitale has a great book called Zero Limits that explains this concept in further detail.